Author, screenwriter and bounty hunter, Richard Lee James, will be featured in a Texas-wide book signing tour starting this month. His book "Secrets of a Modern Day Bounty Hunter" offers gripping true crime stories on hunting fugitives. Author, screenwriter and bounty hunter, Richard Lee James, will be featured in a Texas-wide book signing tour sponsored by the H-E-B grocery store chain starting this month. His book "Secrets of a Modern Day Bounty Hunter," offers gripping true crime stories from his days of hunting fugitives from the law. True crime doesn't get any truer than this. 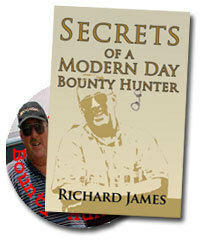 In "Secrets of a Modern Day Bounty Hunter," the true-life stories of author Richard Lee James will grab you by the throat and will not let go. Heart-pounding tales of danger and intrigue, and some of the most hilarious dumb criminal stories you'll ever hear. During his 25 years as a full-time bond enforcement agent, RJ has taken more than 5,000 fugitives off the streets. Published by Our Gang Publishing, the book contains over 150 stories of major arrests of the nation's many bond jumpers. Coupled with 100-plus photographs of the fugitives, investigators, police officers, deputies involved with each unique story, "Secrets" makes an exciting read for the true crime enthusiast. The work is also available in an audio format. Secrets of a Modern Day Bounty Hunter invites you to go along on the hunt with Richard Lee James, known as "The Rhino," as he reveals his unique methods, weapons and tools used to capture his quarry. Come meet "The Rhino" in person to learn more about his secrets and the intriguing field of fugitive recovery during his book signing tour. "I find the fugitive when everyone else has given up," said James. "They can run, but they cannot hide." The H-E-B store #463 in San Antonio, Texas will be the first H-E-B store to host a book signing. Other cities on the tour include Austin, Dallas, Fort Worth, El Paso and Houston. The date is this Father's Day weekend in time for gift-giving, Saturday, June 20th, at 1150 NW Loop 1604 and Blanco Road, from 1:00 pm - 3:00 pm. The program includes testimony from the author, interactive time and book autograph session. For more information on upcoming tour dates visit Bounty Hunter Secrets or call 512-228-6179.